There’s nothing more nostalgic than Winnie the Pooh. In my childhood, at least. I used to read the Milne’s stories over and over. I loved Disney adaptations and there was a time when everything was about Eeyore. Being an only child with not so many friends, these stories gave me a feeling of belonging. Christopher Robin was almost as alone as I used to be but he could find happiness in his imagination. You can’t take away a child’s imagination. No point in trying to force it. Having that as a backstory, I couldn’t have ignored Christopher Robin, the film. No matter whether it’d be good or bad, it was a Pooh story and nothing can be too bad about it. It didn’t get very warm critics response, but it didn’t really matter to me, either. They didn’t enjoy Pooh… Nope, still don’t agree. I don’t believe this was created for the children but rather people such as me – growing up in Hundred Mile Woods and still keeping Pooh close to the heart. I was a bit surprised to see that many adults in the cinema. The number of them was definitely bigger than the kids in the hall, even without taking parents into consideration. I was really glad I am not the only one wanting to reach out to my childhood friends yet again. It might have been just because it was not weekend screening. But well, gave me a feeling of belonging nonetheless. Then the first scenes came and I was sold. I don’t know when exactly the first tear fell on my cheek, but they kept on going until the very end. Story short, it was amazing. And I do not accept any other opinion. 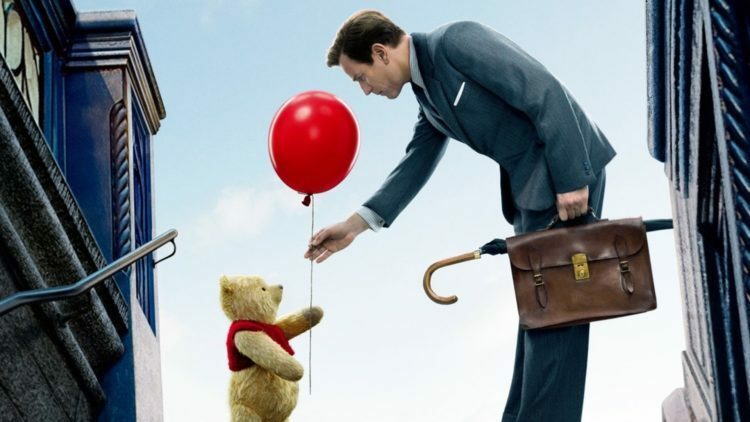 Christopher Robin is an adult with a very busy job and even more responsibilities. He has a lovely wife and a daughter who starts school. He’s an adult the way every child sees adults. He has no time to waste, always working, he’s sacrificing himself for his family in the way no one wants him to. And of course, the last weekend he can spend with his daughter – he has to work. The trailer doesn’t exactly show the reason why I had thought it would have been a simple “must” from his boss. Surprisingly, the truth was a little more reasonable, because he’s the last dam keeping a lot of people from the flood of layoffs. Obviously, there comes Pooh. With his incredible Pooh-logic and in need of help. He has lost his friends and is unable to find them. “What to do, what to do?” And of course, the adventure begins and Christopher has to take care of his childhood friend. He comes back to Sussex and starts the search. Maybe the plot isn’t too bright, in a way it is a children’s story, but it does have a few moments of uncertainty. Some choices on the crossroads make the story fun even when the ending seems obvious. However, the best part is the dialogues. And any other speech, quote or monologue happening in the film. Although I had to see it with Polish dubbing, I can tell how English version would sound and I will definitely watch that with original sound whenever possible. The most enjoyable character is obviously my favourite Eeyore with his dark, dark humour and never-ending depression. Pooh with his wisdom comes right after, he is amazing and brings a childhood joy with a simple “oh”. I couldn’t dream of a better live-action Pooh. I’ve seen comments that the characters look strange and badly. I strongly disagree. Maybe it might feel creepy for Disney-Pooh fans but they had an incredible resemblance to Milne’s story. They were never perfect toys, they were always somehow damaged and old-school. Small reminder – Pooh had a 100th birthday this year, as far as I’m concerned. Finishing this, the CGI and the movements were amazing. I could have sworn they were real and I don’t agree otherwise! The acting was a mix of my favourite British, I wouldn’t have picked them better. Ewan McGregor did his best, Mark Gatiss played his favourite type of small evil, Hayley Atwell had a small part of “my wife Evelyn”, but she was flawless in the costume. This woman should have been born a century ago. Young Bronte Carmichael’s Madeline was definitely more explored character than I expected and she was really nice. Best of luck to her. The voices, in my opinion, were the perfect fit, but I’ve heard originals only on trailers (nonetheless I do believe I won’t change my mind). Jim Cummings, however, has been working as voices on Hundred Acre Wood friends for over a decade so there’s a good chance they had exactly the voice remembered from childhood. And there was Peter Capaldi voicing Rabbit. WAIT, WHAT? Okay, I do need to watch it in original now. He didn’t appear much but it’s enough. Anyway. What’s not to love. This is not really a film I shall review by its editing skills or technical aspects. It was great to watch and it didn’t hurt my eyes while, so it was all good. Maybe apart from music because it was the factor of making my face wet. No, no, all lies, it was an amazing fit which connected the classic Pooh themes with new ones. After all, it was work of two composers: Jon Brian (Lady Bird, Eternal Sunshine of the Spotless Mind) and Geoff Zanelli (associate composer of Pirates of the Caribbean, Rango, or the responsible one of The Secret Window). Most of the times, when some louder tune entered, I burst into tears. I’m not sorry. I don’t really consider this a review. If so, a very, very subjective one. I just want to invite all of you to go back in time for roughly two hours and enjoy your time. Not looking on the film as a notable opus that should break all the walls but as an inner child. When the cinema was an adventure and when the film was just fun.